I hear a noise, teeth clench, abrasive sound. Light disappears, eyes wide, it’s dark as night. I stretch and sit, spit blood, at once I’m crowned. My hands I lift; the room is filled with light. The tears of joy, they stream, my smile is wide. “Oh, Abba, but,” I stop. I laugh out loud. I wipe my face; it’s clean. I fold the shroud. My Son, my Heart, dawn’s near, Your glory’s bared. My will through You is done, restored each one. Our love and grace, for them, will not be spared. Because of You, they’re free, each daughter, son. Faith moved the rock; outside, I greet the day. I give you peace, I live, I AM The Way. Susan, I love this. It gave me shivers of joy. Oh wow, you were there! Lol! It was fun having that fly-on-the-wall perspective. Glad you enjoyed it, Karen. So moving! Thank you for helping us celebrate our Savior today! 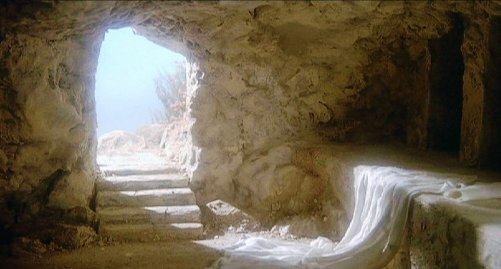 I have never ever been “in the tomb”. Little Monk and the Garden, now you and the Tomb! Susan, you have crashed another unthought assumption. Thank you. He is alive, Julia. I can’t wait to watch A.D. tonight! Praise God,all glory Him who sets on the throne! He has risen and paid the price. That we might live. Thank you Susan for a wonderful reminder this morning. Awesome poem, Susan. Loved it. He has done it! Our freedom is won! Blessings to you this Resurrection morning. You, too, Mel. To you and your family and your entire church. 🙂 Looking forward to your finale post. He is risen. This is the day of rejoicing to carry us all year long. Thank you for this Easter post, Susan. Happy Day. And again, Beth, peace to you and Geoff. Beautiful,sis 🙂 Happy Easter to you. Blessings. Bless you and your family, Karina.